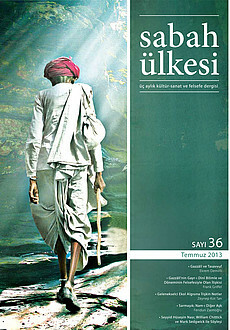 The current edition of Sabah Ülkesi is devoted to Traditionalism. Sabah Ülkesi is a quarterly magazine on cultural issues which is published in Turkish by the Islamische Gemeinschaft Milli Görüş in Germany and is distributed free to members. Milli Görüş, "National (world-)view," is the second largest Islamic organization in Germany after the mosque associations affiliated to the Turkish Directorate of Religious Affairs, and has branches in some other European countries. It was traditionally affiliated to the political parties lead by the grand old man of Turkish Islamism Necmettin Erbakan (1926-2011), and since the decline of the last of these parties in the 2000s seems to concentrate on religious activities instead of Turkish politics. The title of the magazine, Sabah Ülkesi, is a translation of Morgenland, a German term which is even more old-fashioned than 'Orient' and evokes the Arabian Nights and the infatuation of German poets with Persian and Arabic in the age of Romanticism. Apparently the purpose of this publication is to bolster the politics of the Milli Görüş movement with a broader cultural outlook and a more general critique of Western modernism. And who could serve this purpose better than Western critics of modernism? Thus the April issue of Sabah Ülkesi was dedicated to German Romanticism with Caspar David Friedrich’s iconic painting ‘Wanderer above the Sea of Fog’ adorning the cover, and a special issue on Traditionalism is the sequel to the Romanticism issue. This special issue was discussed on the cultural program of TRT, the Turkish state television channel (see this clip on YouTube). A description of it follows. In a leading article, “Tradition and Traditionalism as a Social Sorting Device” (Gelenek ve Geleneksel Ayrıştırma Aracı Olarak Gelenekselcilik), Nuri Sağlam deplores how tradition has been juxtaposed to modernity whenever Muslims and Islam are dealt with so that Muslims can easily be denounced as fanatic and reactionary whereas in fact, in a world which is changing faster and faster, tradition can serve as an opportunity for liberation. Other articles are dedicated to the protagonists of the Traditional school, in particular those who converted to Islam, as for example in the introductory article “Four Travelers Encountered on the ‘Eternal Journey’: Guénon, Schuon, Burckhardt and Lings…” (’Daimi Yolculuk’ta karşılaşmış dört Yolcu) by Melek Paşalı. Serap Kılıç describes in “Philosophia perennis and Its Manifestation in the Course of History” (Ezelî Hikmet ve Tarihî Süreçte Tezahürü) the Traditionalist idea that sacred knowledge based on a divine origin can be found in all authentic traditions. Zeynep Kot Tan addresses in her article “Notes Concerning the Perception of the Traditionalist School” (Gelenekselci Ekol algısına ilişkin Notlar) what should be the major problem for orthodox Muslims with regard to the Traditionalist school—that their approach relativizes the truth claims of any one particular religion—but defends Traditionalism against (unnamed) Muslim detractors who equate it to the ‘liberal-secularist’ idea that all religions are the same. Discarding such ‘reductionist concepts’ she claims that religions have within their very own framework instruments that allow them to attain truth. In “The Knowledge of Being and the Being of Knowledge: The Understading of Being and Knowledge in René Guénon” (Varlığın Bilgisi Bilginin Varlığı: René Guénon’un Varlık ve Bilgi Anlayışı), Numan Rakipoğlu writes that Guénon rejected the subject-object distinction that characterizes most post-Cartesian Western philosophy, and adopted both Vedantic anti-dualism (advaita) and the Sufi concept of unity of existence (waḥdat al-wujūd) to express his point that there is no clear separation between subject and object because both are derived from Being. He leaves the shackles of Aristotelian logic behind him, and hence his approach is closer to that of wise men like Ibn ʿArabī, Qūnawī and Jīlī. His ideas contradict the nominalist concepts which underlie most of modern philosophical and scientific concepts. The aspect of the ‘transcendental unity of religions’ is also dealt with, by Nurullah Koltaş in “A contemporary/ modern Wiseman: Frithjof Schuon and Traditionalism” (Çağdaş bir Arif: Frithjof Schuon ve Gelenkselcilik). Koltaş gives a brief account of Schuon’s life, and defends him against allegations of syncretism, even though he turned to Native American religion after having converted to Islam. Religions are not mixed together they are already one in their essence. Koltaş seems to be the most prominent of the special issue’s authors: he teaches philosophy at Trakya Üniversitesi and has published a book on the Traditionalist school and Islam (Glenekselci Evol ve İslam, Istanbul: İnsan Yayınları, 2013). In another biographical article, Ercan Alkan addresses discusses “Titus Burckhardt: Traditionalism and Sufism” (Titus Burckhardt: Gelenekselcilik ve Tasavvuf) where he describes how Burckhardt traces back all aspects of Islamic art to the principle of tawḥīd. According to Alkan, Burckhardt saw Sufism as the internal direction and essence of Islam, and as a commentary on the Qurʾān. The title of the article “Geleneğin sinemadaki izsürücüsü Tarkowski” is difficult to translate because it alludes to the title of the Russian director Andrei Tarkovsky’s most famous film: “The Stalker of Tradition in Cinema” sounds a bit odd in English. In this contribution, Özay Aslan alleges an intellectual affinity between Tarkovsky and the Traditionalist school. He refers to Tarkovsky’s book Sculpting Time where the director claims that “the East (i.e. the Easterner) doesn’t say a word about himself but loses himself in God, nature and time and reemerges in them.” However, Aslan does not claim or try to show that Tarkowski was influenced by the Traditionalist school. Finally the issue contains three interviews, one with the leading Traditionalist Seyyed Hossein Nasr, and one each with Mark Sedgwick and William Chittick. In his interview, Nasr declares that he became attracted to and finally convinced by Traditionalist thought because the Traditionalist school provided a critique of the modernist worldview which rests on the ‘first principles.’ According to Nasr it gives post-Christian Westerners an opportunity to rediscover their traditions, and can enable the Muslims who live as minorities in the West to defend themselves against the onslaught of secular ideologies. But for this purpose they also have to overcome the inferiority complex which Western colonialism has instilled into them. Unlike Japan, China or India, which have to various degrees adopted some form of Western modernism, the majority of Muslims remained devoted to their faith and thus remain an obstacle to western dominance. Islam also continues to be a whole way of life from which no single elements could be adapted. One cannot simply practice some aspects of Sufism like one can practice yoga, one has to become Muslim, and many in the West have done so. William Chittick stresses right at the beginning that he does not want to be considered a Traditionalist or a member of any other ‘school.’ However, he confesses that when he was a student reading Schuon had a considerable impact on him because he did not believe in the ‘American Way of Life.’ Asked whether he thinks that other religions might contain some truths from which the Muslims might profit, Chittick answers that just as one first begins to reflect on one’s own language when one learns another one, people begin to reflect on their religion once they encounter another one. According to his experience they then return to their religion with even more conviction. In response to a question about why Sufism has become so popular in the West, Chittick states the many in the West encounter not only Islam, but also Christianity and Judaism in narrow-minded, fanatic form, but encounter Sufism as a message of love and mercy in the form of beautiful poems. However, one should not make the mistake of separating Sufism from Islam, from the teachings of the theologians and the regulations of the sharia. Chittick says he does of course not renounce such advantages of modernity as computers (although Illich has alerted us to the Medical Nemesis), but the people of earlier periods were far more aware of what it meant to be a human and of what God demanded from them. It was not only modernization and modernism which disrupted the connection between Muslims and their heritage: another factor was according to him the politicization of Islam. Muazzez Tümay talks with Mark Sedgwick, whom she introduces as a scholar with a critical approach to Traditionalism, about “The other side of Traditionalism” (Gelenekselciliğin diğer yakası). Starting with the analysis that Traditionalism is Western philosophy cloaked in Islamic terms, the interviewer asks Sedgwick why he does not consider Guénon a Muslim although the circumstances of his passing away are well known. Sedgwick replies that it is for God to judge whether Guénon was a Muslim or not but that it is apparent that there is no major change in his writings between before and after his conversion to Islam. And this is the case because he wanted to discover the perennial philosophy which is our Urreligion. Sedgwick states that the Traditionalist critique of modernism has some aspects in common with Romanticism, but ‘Guénon was not Goethe’ and Traditionalism lacks the obsession with individualism and originality that characterizes Romanticism. Sedgwick also refuses to accept that other currents of Traditionalism have split off from ‘Islamic Traditionalism.’ As a scholar, it is not his task to say what true Traditionalism (or true Islam) is. In response to a question about why Traditionalism is so successful in Turkey although he has called it a ‘school for intellectuals,’ Sedgwick responds that historical experiences in Turkey and Russia were completely different from the West. This might explain why Traditionalism attracts far more interest there. Asked what motivated him to study Traditionalism, Sedgwick responds that in the beginning he was motivated because he himself found Traditionalism fascinating, and then he wanted to understand why others were fascinated by Traditionalism. After publishing Against the Modern World he thought that he had done his duty and could now address other subjects, but that was not possible because people continue to ask him about Traditionalism. Thanks for summarizing the articles, since few readers of this blog will have access to the journal.